Today we were supposed to build the chimney through the roof to its final height. 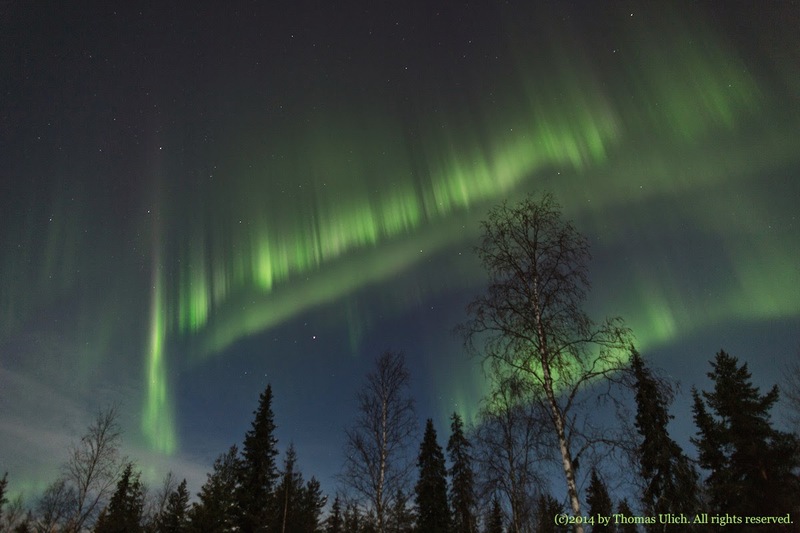 However, the morning started at –25°C, but the temperature rose to only –2°C at lunch time. It was a perfect, beautiful, sunny day, but at the height of the roof the wind was so cold that work was not feasible. Thus we did some preparations and installed some planks on the roof to move about safely, and we shall try again tomorrow. However, today the interior got the finishing touches, which means that all skirting boards were installed, and the remaining corners were tidied up. Also, the windows and doors got their final touches: the wooden strips were put in place, which hide the gaps between door frames and adjacent plaster boards. 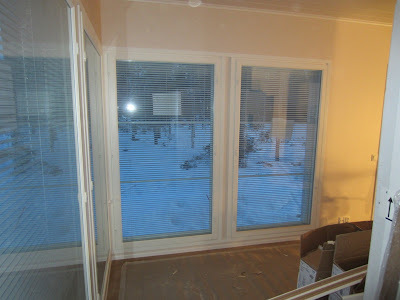 Also, the blinds where released and tested. Above is a view of two of the living room windows. Another team from the house company arrived today. One of them will do the plumbing, i.e. place sinks and toilets and install taps, while the other will do all the electrical stuff. 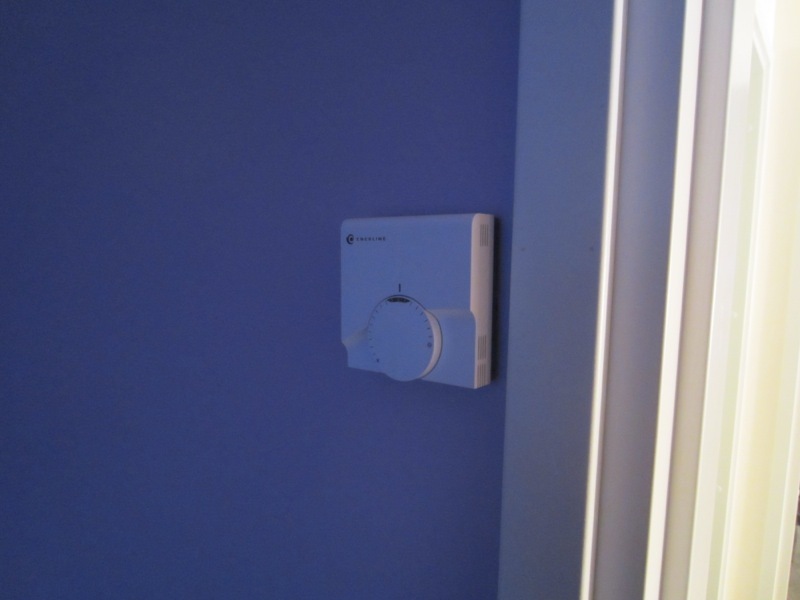 Today the latter managed to get all electrical, aerial, and internet sockets installed, and most of the switches. 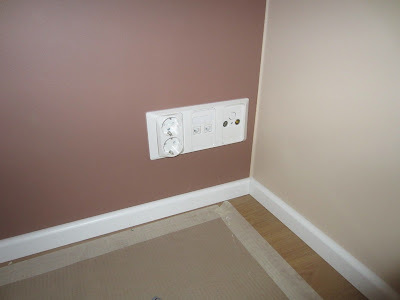 The photo above shows the corner where our TV will be located and where all three types of sockets are present. 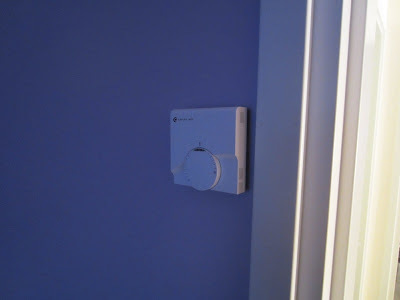 Also the thermostats appeared in most rooms, thus we can now control our floor heating in a per-room fashion. Nice. By the way, I learnt this morning that our houseshow will take place on Thursday, 11th April 2013, between 1700h and 1900h. Then the sales person will be present and anyone can come and have a look.